Psst, hey you. 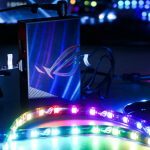 Yeah, you, the one who’s dying for a sweet gaming laptop, but just can’t justify the $2,500+ price tag of beasts like the ROG G703. We offer a wide range of enthusiast-friendly options that fit into almost any budget, including TUF Gaming FX504, which packs in Intel’s 8th Gen Core i-series and NVIDIA GeForce discrete graphics. You’re assuming an entry point of at least $1,000, right? Nope, think lower. And with better gaming performance than you might expect. 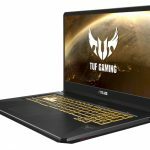 The TUF Gaming FX504 gaming laptop is designed to balance price and performance, and key to achieving that goal is offering a range of configurations that allow you to better tailor your laptop to your specific needs. 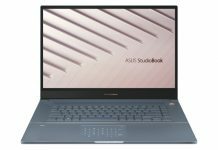 The FX504 features an eighth-generation Intel processor up to a six-core Core i7-8750H and can be configured with up to 32GB of DDR4 RAM. Most importantly, it comes armed with NVIDIA GeForce discrete graphics capable of running all your favorite titles. The model I tested out for this article is the FX504GD-ES51, which boasts an Intel Core i5-8300H, a GTX 1050 GPU, 8GB of RAM, and a 1TB FireCuda SSHD for just $799 USD. 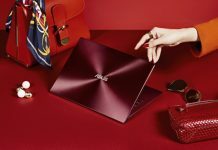 A multitude of storage options, including 16GB of Intel Optane memory and PCIe-based SSDs in a range of capacities, allows you to choose the speed and capacity that makes the most sense for you, but even the least-expensive models boast Seagate FireCuda solid-state hybrid drives that load games much faster than standard mechanical disks. Being part of our TUF Gaming family, the FX504 is designed for durability. Its plastic chassis is lightweight, yet sturdy enough to protect the internals and display from the rigors of daily travel. I can attest that, even after occasional dings and drops, the chassis still looks brand new. The keyboard switches are designed to hold up well to wear; their 20 million-press lifespan exceeds industry standards for laptops. Further, the keys are backlit, which is great for gaming at night, and a useful feature in games with too many controls to keep track of. In my experience, a quick glance down always helps me re-adjust. 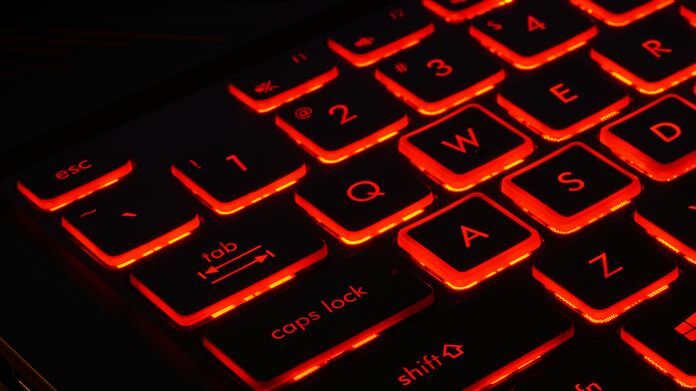 The WASD keys are further emphasized by an extra ring of light, making it easier to locate them in the dark. As a bonus, the “W” key has a raised dot on it for quick realignment without needing to look away from the action. 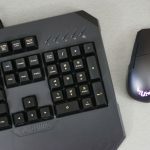 Another nice touch is a strategically-placed bulge on the space bar that gives my thumb a wider area to strike during fast-paced gaming sessions. The FX504’s desktop-like layout is complete with a number pad on the right side. You end up with lots of keys squeezed into the chassis as a result, but our clever configuration makes the design easy to navigate. For example, the arrow cluster, which I use all the time, is slightly offset, and easy to find by feel. 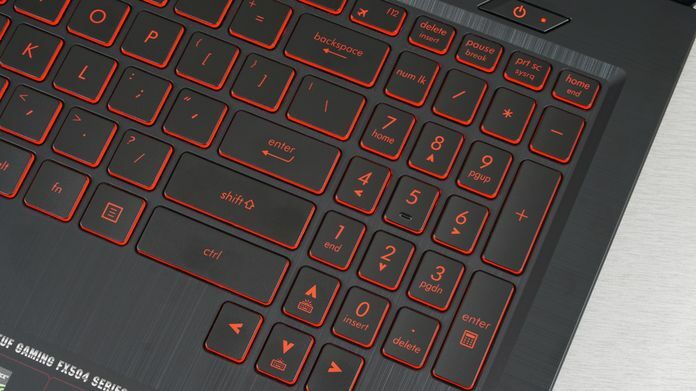 The keys are optimized for gaming. Their 1.8 mm of travel delivers satisfying key presses, and the 62g of force needed to press each key down fully represents just the right balance between firmness and comfort. Our Overstroke technology shifts the actuation point higher in that 1.8 mm stroke, so your presses register faster for better response in games. The FX504’s 15.6” display feels luxurious, especially if you’re used to a smaller 13.3” laptop screen. Something about leaning in close to a big panel makes gaming seem more immersive. The 1920×1080 native resolution complements the GeForce GTX 1050 and 1050 Ti graphics, and the top-of-the-line SKU boasts a 120Hz high-refresh panel with a 3-ms response time for silky smooth, clear visuals. A large screen necessitates a larger chassis, but I found that to be a bonus in games. The long, wide space between the keyboard’s bottom edge and the frame’s lip was great for resting my wrists. And for a laptop that doesn’t fall into the thin and light category, the FX504 is still quite mobile. It weighs about five pounds, and measures in at just shy of an inch thick. 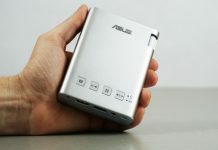 That means there’s plenty of room for ports, including a full-sized HDMI port for plugging into an auxiliary display or a big-screen TV; a GigE jack (in addition to the latest 802.11ac Wave 2 WiFi that’s baked into the laptop itself); three USB Type-A ports for peripherals and additional storage; and an audio combo jack that’s augmented by DTS Headphone:X for virtual surround sound when you connect a stereo headset. In addition to protecting the FX504’s outside surfaces from wear and tear, we also added mechanisms inside to keep everything running cool and stable. Anti-dust tunnels around the fans play an integral role in cooling by channeling particles away from the heatsink fins to prevent buildup that can compromise stability and performance over time. The FX504 utilizes a dual-fan system that draws cool air in from its sides and exhausts warm air out the back. 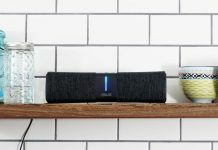 A specially designed trapezoid-cut lid ensures the vents in the back are never obscured, regardless of the display’s position, so heat escapes unobstructed. The fans are strategically placed under the WASD cluster on the left and number pad on the right. Consequently, the coolest spot on the keyboard is where your keep your hands positioned during long gaming sessions. Three fan speed profiles allow you to control the FX504’s noise and power consumption. 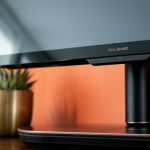 Silent mode, appropriate for word processing, email, and Web browsing, keeps noise in the 35dB(A) range, while Balanced mode improves cooling in more demanding workloads, and Overboost maximizes airflow to keep clock rates high in games. Just press the Fn and F5 keys at the same time to turn this mode on. The same shortcut toggles back to Silent mode when you’re done gaming and back on the Windows desktop. To quantify how this laptop performs in the real world, we installed several of our favorite games and ran a number of benchmarks while playing. Even at High-quality settings, the FX504’s GTX 1050 GPU hit triple-digit frame rates during our Rocket League runs. This isn’t the most demanding game out there, but it serves as a bellwether of sorts. If your graphics subsystem can’t hack it in Rocket League, it probably won’t perform well in other titles. Fortunately, the GeForce GTX 1050 is fast enough for a smooth experience. Our chart’s performance range looks extreme, varying from the mid-80s to as high as 240 FPS. Dips are normal when goals are scored or explosions go off, but even the minimum frame rates were plenty fluid. 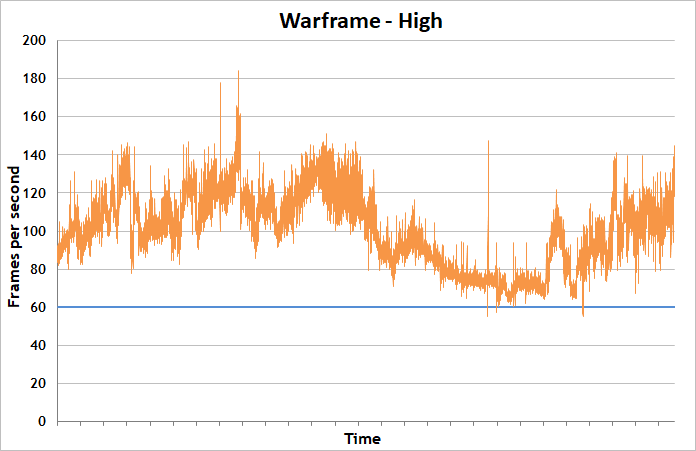 Although the FX504 didn’t whip through Warframe with the same alacrity as it did Rocket League, we still recorded excellent frame rates. Warframe is a visually dense game, and at the High preset, its environments looked lush. When the action really heated up and I had to fight off a veritable horde, performance dropped quite a bit, but it remained above 60 FPS, which was more than enough for a smooth, enjoyable experience. 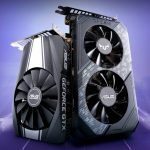 If you have Fortnite-obsessed progeny (or like to indulge yourself), you’ll be glad to hear the FX504’s GeForce GTX 1050 delivers great performance in this insanely popular title. 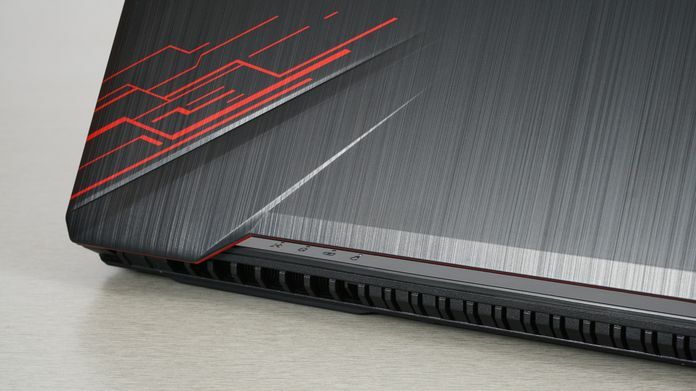 It’s rare to find a gaming laptop that costs about the same as a mid-range ultrabook, but you’ll be able to dance, build, snipe, shoot, and goof without breaking the bank. Fortnite is one of those games in which you can spend way too much time jogging around trying to find something to do. That’s exactly what I did during my benchmark run. 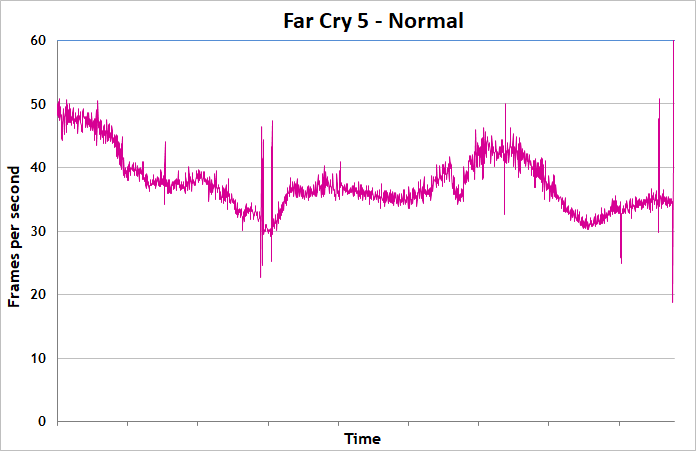 As a result, our chart reflects a fairly steady frame rate. When there was some real action (like a 12-year-old fragging me from behind and then dashing off on a wooden bridge he was making), the frame rate dropped a bit. Even so, frame rates remained in the 80 FPS range for the most part, and gameplay was smooth, despite a handful of slower frames using High detail settings. Overwatch was the FX504’s first real trial. It’s a graphically rich and somewhat demanding title compared to many popular mainstream games, but it looked and ran great during our benchmarks. 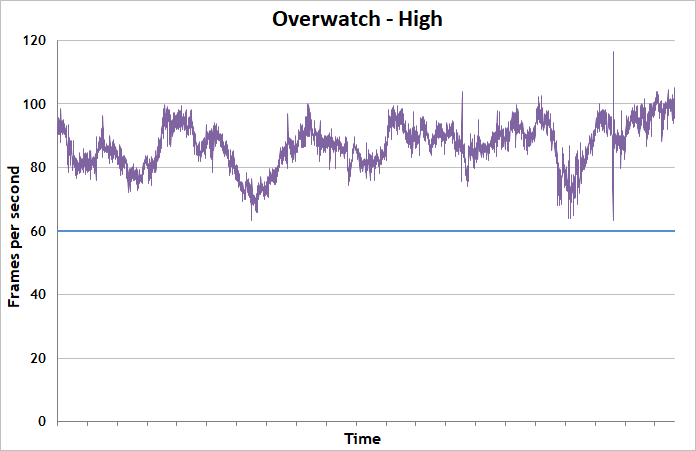 Expect playable frame rates from the GTX 1050 in Overwatch, although I did measure a couple of slow-downs during particularly hairy skirmishes with lots of players converging on a capture point all at once. Overall, the experience was terrific, and the GTX 1050 never dipped below 60 FPS. Everything looked nice and smooth as I finished off Roadhog again and again. 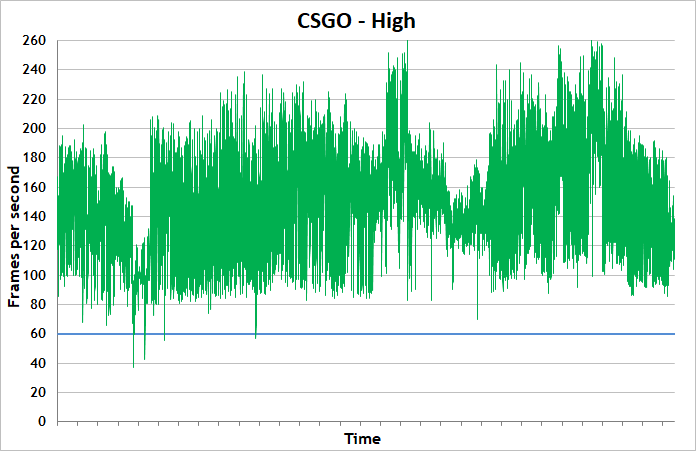 The frame rates we measured in CS:GO covered a wide range, but the average exceeded triple digits. 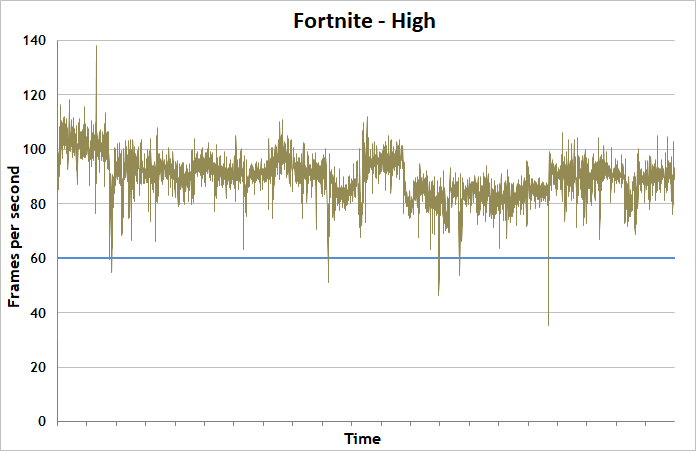 The action varied quite a bit during my test runs, as it often does when you’re trying to survive a firefight, and that’s likely where the extreme dips and spikes come from in the chart. Qualitatively, though, gameplay didn’t suffer due to this variance. Even when it was pushed hard, the GTX 1050 mostly delivered above 120 FPS. Our graphics subsystem clearly has plenty of headroom in CS:GO if you want to try a higher-quality preset, although we think you’ll be quite happy with the balance between performance and details using High settings. Far Cry 5 was the only game I tested that wouldn’t run above 60 FPS using the High preset at 1920×1080. If you want to play a demanding title like Far Cry 5 on a GeForce GTX 1050, you’ll have to either dial down the quality or the resolution. Even using the Normal settings, I was only able to sustain frame rates in the 30-40 FPS range. While not exactly ideal, the game was still enjoyable at that performance level. 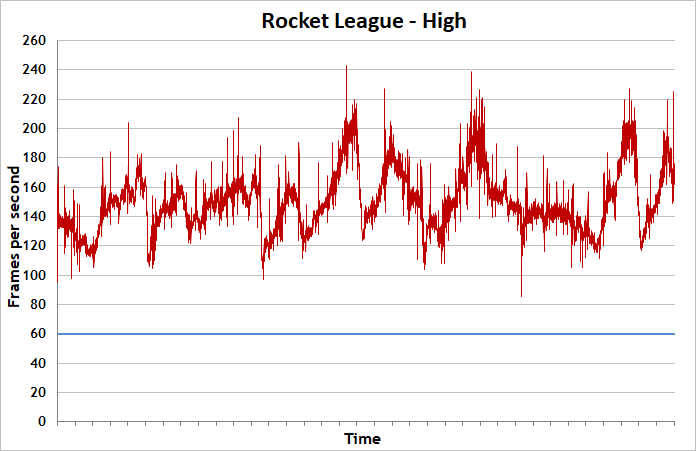 Our graph shows a fairly tight range, meaning the experience was consistent, without big lag spikes. Graphical fidelity was acceptable and the play was fluid, which made me pretty happy given the price of my budget-friendly gaming laptop. 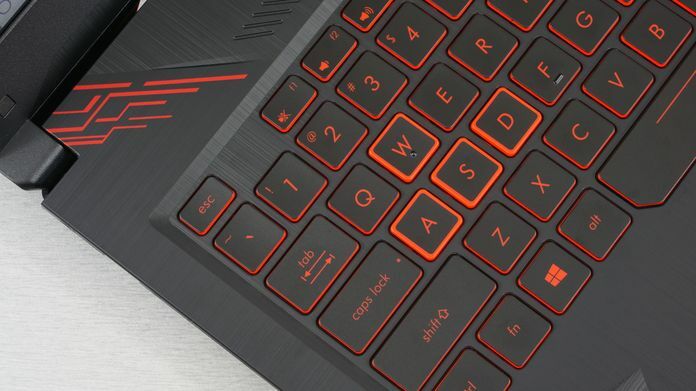 Gaming laptops have always involved some trade-off between size, price, and performance. 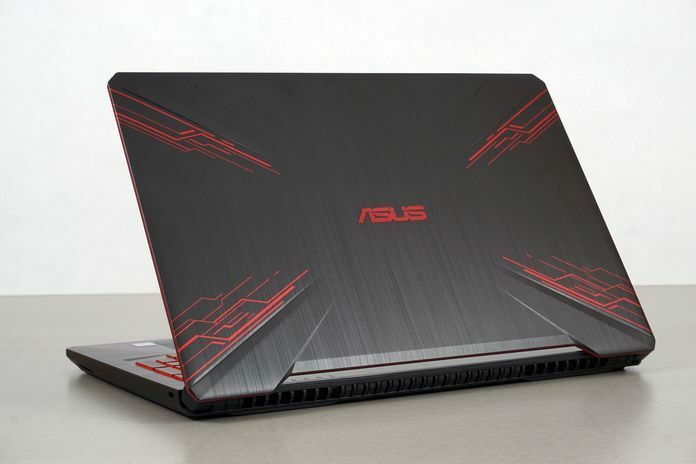 But the latest energy-efficient architectures from Intel and NVIDIA now make it possible to pack lots of performance-oriented hardware into mobile notebooks like our TUF Gaming FX504. In this case, the real kickers are its affordability, sleek design, and emphasis on durability. 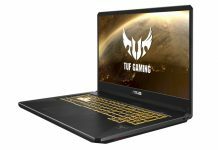 The TUF FX504 gaming laptop and the GeForce GTX 1050 graphics inside it let you game for real, and the price is amazing. You can get one with the same specs as the model I tested for ​$799 USD and $999 CAD. 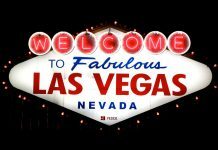 Check the table above for retailers selling the FX504 in North America.